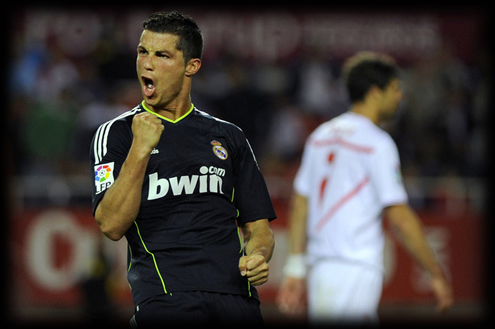 Real Madrid smashed Sevilla in the Ramon Sanchez Pizjuán stadium, winning by 2-6. Cristiano Ronaldo was the MVP of the match, scoring a poker (4 goals) and helping Real Madrid temporarily shortening the gap to Barcelona to 5 points. Sergio Ramos and Kaká scored the other two goals. Real Madrid showed one more time that despite the title race is almost decided in favor of Barcelona, they'll keep fighting until the last match. Cristiano Ronaldo scored the second "poker" of his career (4 goals in a match), and passed Lionel Messi for the Pichichi award (highest scored in the Spanish La Liga). With an impressive 2-6 win, Real Madrid is now 5 points behind Barcelona, who only plays tomorrow in the derby against Espanyol. Anyone who believed Real Madrid would take their foot off the accelerator for the last four matches of the season was surely mistaken. In a display of stellar football, the "Merengues" crushed Sevilla at the Sanchez Pizjuan this Saturday night. Cristiano Ronaldo scored four times (poker) to move top in the league scoring table (Pichichi award). Wearing the visitors black kit, Real Madrid had three goal scoring opportunities in the first 12 minutes of the match. It was just a matter of time before they would break the deadlock. Then, around the 20th minute, Ozil swung in a corner kick and Sergio Ramos beat out Cristiano Ronaldo in getting a head to the ball and beating the keeper. CR7 sent a ball off the post two minutes later, but he didn't take too long in getting his name on the scoresheet. Marcelo received the ball at the top of the box on 30th minute and curled it to Pepe at the opposite side. The Portuguese out-jumped the defender and headered it to Cristiano Ronaldo, who controlled it perfectly and fired into the back of the net once more. But the goal of the night came off the boots of Kaka. The Brazilian found Ozil charging into the left side of the box, the German tapped the ball right back and Kaka curled a low shot past the left side of the goalkeeper, for his 17th goal of the season. Sevilla pressured after the restart and were hansomely rewarded. The hosts pulled one back on the 61th minute when Álvaro Negredo got the best of Iker Casillas following a pass by Romaric. But Real Madrid answered back just four minutes later. Negredo passed to a defender at the top of the penalty area, Cristiano Ronaldo received the ball following an error by the Sevillista and put the ball into the back of the potato sack. Cristiano Ronaldo wrapped up his hat-trick only five minutes later. The forward beat the offside trap at the midfield line after a good pass by Mesut Ozil, galloped towards the goal with no defender in sight and punched the ball under Sevilla goalkeeper Javi Varas. Just when you thought Real Madrid would take their foot off the gas, Ozil sent a deep ball into Sevilla territory and Benzema chased it down just before it crossed the byline. The striker curled a low pass into the middle of the box and once more, Cristiano Ronaldo met it cleanly for the team’s sixth of the night. The same can be said for Sevilla, who instead of throwing in the towel continued to attack the Madridista goal. With little over six minutes left to play, Negredo successfully got his head to a corner kick to make it 2-6. The score does justice to the football displayed at the Sanchez Pizjuan stadium and the magnificent performance of Cristiano Ronaldo, who showed Sevilla who is CR7. Remember that you can watch Real Madrid vs Getafe livestreams, for the Spanish League, online here on ronaldo7.net, this Tuesday. Cristiano Ronaldo will probably play, but news on this matter will be released later on this week.